Controversy over the lease arrangement between the General Services Administration and the Trump International Hotel in Washington continues, with GSA’s inspector general office confirming Wednesday that it has opened an examination of the agency’s handling of the lease. “Our Office of Inspections has initiated an evaluation of GSA’s management and administration of the Old Post Office Building ground lease,” an IG spokeswoman told Government Executive. As Federal News Radio reported, GSA itself first confirmed the launch of the examination—requested by congressional Democrats in February—on Tuesday. “GSA welcomes the oversight of the OIG and will continue to work with it on its evaluation,” the agency said in a statement Wednesday. In 2013, The Trump Organization won a 60-year lease to create a luxury hotel on the historically protected Old Post Office property. The lease came under challenge after November’s election by groups who said it presented an unprecedented conflict of interest. In March, Kevin Terry, senior realty contracting officer for the National Capital Region of GSA’s Public Buildings Service, declared the Trump Organization “in full compliance with the lease.” Democrats continued to protest that GSA had not delivered documents relating to the lease. 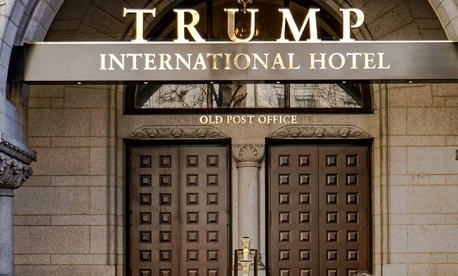 Several nonprofit legal groups filed lawsuits accusing Trump of violating the Constitution’s Emoluments Clause by continuing to own a hotel at which many political groups and foreign officials stay with ostensible hopes of currying favor with the White House.